Thrombosis is the formation of a blood clot, known as a thrombus, within a blood vessel. It prevents blood from flowing normally through the circulatory system. Have you ever wondered what stops you from bleeding when you hurt yourself? In a healthy body, blood clots play an important role in this. At the site of a cut, blood platelets and red blood cells are held together by a rope-like molecule called fibrin. This forms a blood clot, which plugs up the cut and stops bleeding. This is an important process, but it can cause major health issues when it happens at the wrong time. When a blood clot forms in the veins, it is known as venous thromboembolism. This can cause deep vein thrombosis and pulmonary embolisms. When a clot forms in the arteries, it is called atherothrombosis, which can lead to heart attack and stroke. Deep vein thrombosis occurs when a blood clot forms in a major vein, usually in the leg. This blood clot stops blood from flowing easily through the vein, which can lead to swelling, discoloration, and pain in the leg. It is often diagnosed with an ultra sound. Patients with DVT are at risk for developing post-thrombotic syndrome (PTS). PTS can involve chronic leg swelling, calf pain, calf heaviness/fatigue, skin discoloration, and/or venous ulcers. A pulmonary embolism is a blood clot that has traveled to the lungs. It often starts as a DVT. A piece of the blood clot can break off and be carried to the lungs. PE can block the flow of blood to the the lungs, causing serious damage to the lungs and affecting a person’s ability to breath. This can lead to serious injury and death. If you are experiencing these symptoms, you should seek immediate medical attention. What is the treatment for DVT and PE? The most common and effective treatment is to administer anticoagulants (clotting prevention agents). These drugs block the formation of new clots. Over time the body’s natural processes will begin to dissolve the clots that have already formed. Initially, injections of heparin or low-molecular weight heparin are used because they act within hours. For longer term treatment, patients have a variety of medications that can help. Direct oral anticoagulants (DOACs) are the guideline recommended treatments. They are newer drugs that work by blocking specific clotting factors. Another medication used is warfarin. It is the more traditional therapy and has been used for the past 50 years. It is often sold under the brand name Coumadin and taken orally. Unlike, heparin or low-molecular weight heparin, 3-5 days is needed before warfarin reaches full therapeutic effect. Take a look at NATF’s Anticoagulant Comparison Chart to understand the differences between these drugs. Can blood clots be dissolved or removed? The safest way to dissolve a clot is to let the body’s own clot-dissolving processes take effect. This can take anywhere from weeks to years, although some blood clots do not go away. 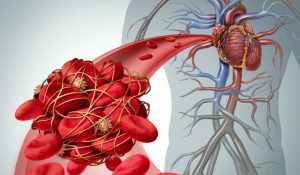 In the case of massive or life-threatening clotting, clot dissolving drugs can be administered via catheter directly into the blocked blood vessels to dissolve recently formed clots. Thrombolytic drugs do come with a risk of bleeding. In certain emergency situations, clots can be removed surgically, but this increases the risk of further clotting. What are the risks of blood clots recurring? The chances of a recurrent blood clot is dependent on the circumstances leading up to the first clot. For example, if the blood clot occurred as a result of surgery or trauma, then the chances of re-occurrence is relatively low. On the other hand, for people who developed unprovoked blood clots and have stopped treatment after 6 months, the chance of recurrence is approximately 20% in the first 4 years and roughly 30% after 10 years. With all anticoagulant medications, there is an increased risk of bleeding. Signs of excessive bleeding can include prolonged nose bleeds, severe bruising, bleeding gums, vomiting or coughing up blood, and, for women, increased bleeding during menstruation. Patients with cancer, over the age of 65, and with renal or liver failure, face a higher risk of bleeding. Patients who are concerned about risks associated with taking an anticoagulant should speak with their doctors about their concerns.